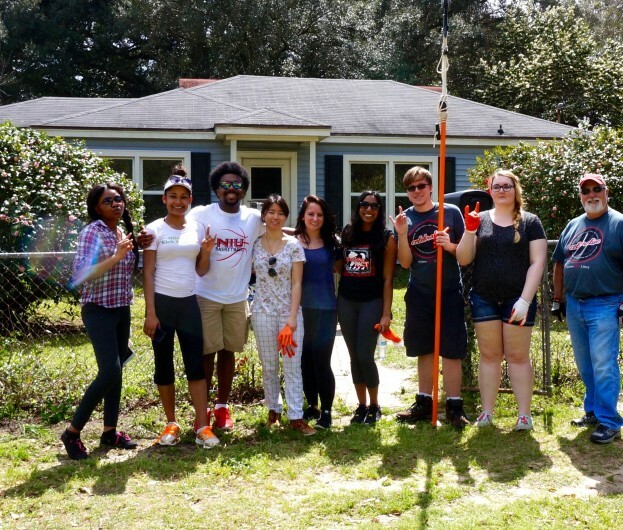 NIU students clean up the yard of a senior citizen in Pensacola. 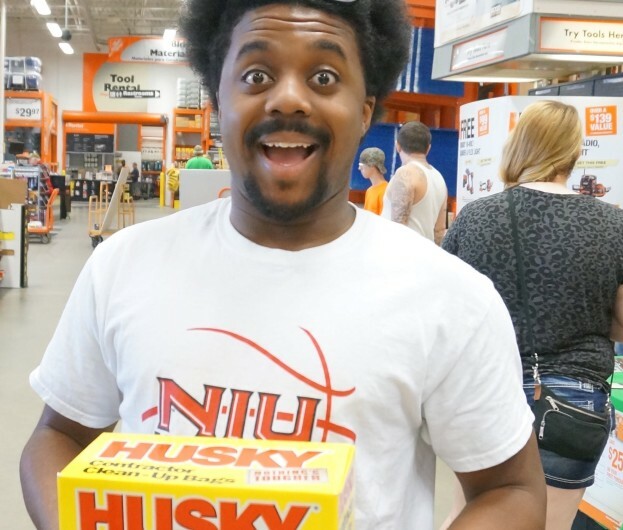 Isaiah Booker gets clean up supplies. 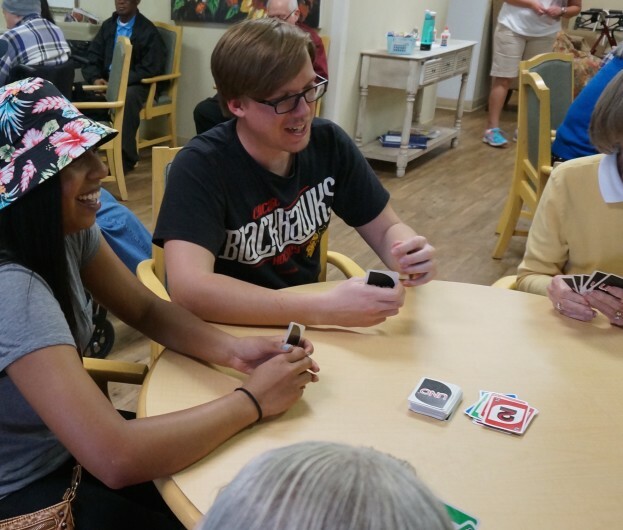 Tim Bukowski and Adriana Gorre play Uno with seniors at an elder day care center in Pensacola, Fla.
Naiyu Shuh plays flashcards with a senior at an elder day care center in Pensacola, Fla.
Huskies enjoy a Florida sunset at historic Ft. Pickens along the Gulf Islands National Seashore. Many students long to spend spring break on the beach, basking in the warmth of the sun. Others like to work on service projects. And some want to get a jump on job searches. 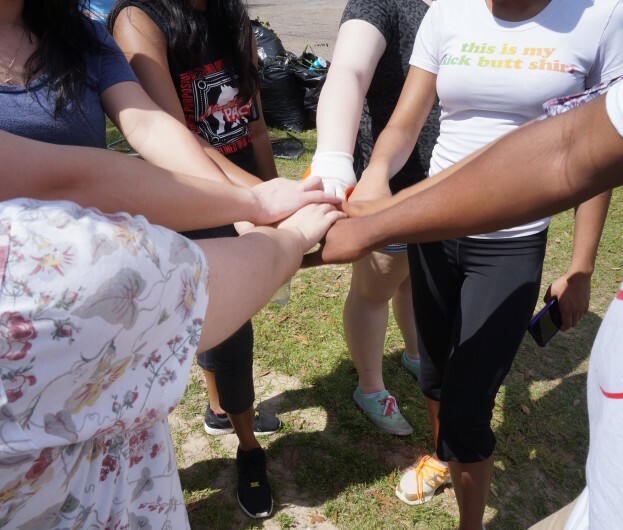 A few NIU students checked all of the above during the sociology and College of Liberal Arts and Sciences Service Spring Break Trip to Pensacola, Fla.
Jack King, director of student professional development for the college, has been bringing students to Pensacola for service trips for 22 years. Isaiah Booker, a sophomore majoring in Community Leadership & Civic Engagement, agrees. He chose to attend the service trip instead of heading south with his fraternity brothers. “I wanted to give back,” Booker says. Stefani Jivkova, a senior psychology major, also wanted give back. Teeanna Brisco wanted to do good. And the freshman sociology major also wasn’t crazy about heading home to Madison, Wis. for break. 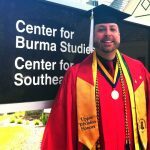 “It sounded better than going farther north. And I wanted to meet some new people,” she says. 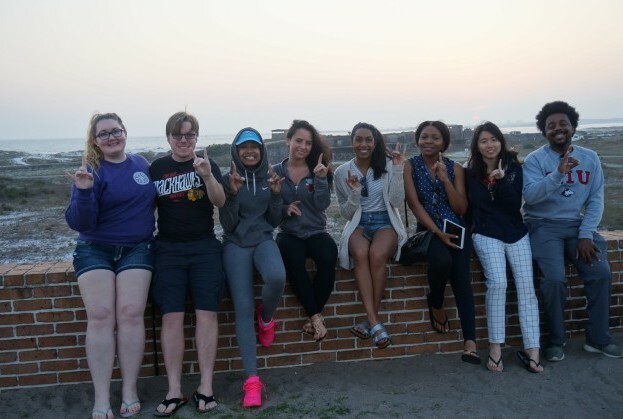 In all, eight NIU students traveled by van down to their base camp: a beach house on the Gulf shore of Santa Rosa Island, a barrier island across the bridge from Pensacola. During the beginning of the week, students worked on projects for the Council on Aging of West Florida. They provided yard cleanup for senior citizens—trimming trees and bushes, hacking away at weeds and raking pine needles. Later in the week, they volunteered at The Retreat, a day care center for people with Alzheimer’s disease. 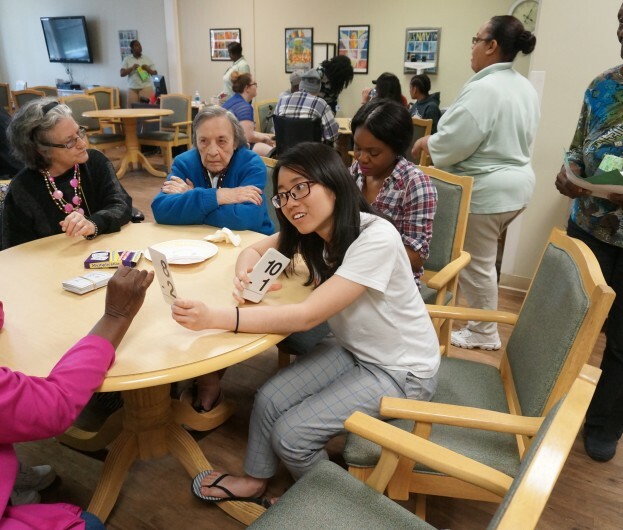 Students socialized with the seniors, sharing snack time, making crafts and playing cards. Interacting with the seniors gives students a perspective on aging they may be unfamiliar with. They also discover careers providing senior services. “Students develop an inter-generational sensitivity. It gets them to think about age in a cool way,” King says. In the evenings, students met with people who have used their educations in the humanities to develop successful careers. They included a juvenile probation officer, the owner of a management company for non-profits that serve people with disabilities, the communications and marketing director for the Council on Aging of West Florida and a crew leader for Habitat for Humanity. “It’s an opportunity to show students how their own academic programs can relate to different careers,” King says. Teri Schmidgall, a career counselor at NIU also attended the Pensacola trip. She spoke with the students about “unpacking your spring break” — how they can use the experience as part of their career story when seeking internships and their first professional jobs. Students also got to enjoy some quality beach time. They jet skied, lounged on the white sand beaches, dined on local seafood and Krispy Kreme donuts and played games. King says the students typically take away more than they expected. They see a different part of the country, and people whose culture, values and circumstances may be very different from their own.